James moved into the quarterfinals of the World Championships, as he beat Michael Smith by four sets to three. James came back from the edge of defeat, having trailed Smith 2-0 and 3-1 at Ally Pally. James showed why he has won seven PDC majors, showing true grit to get the better of Smith. James had missed two darts to make it 2-2 in sets, as Smith punished a rare mistake from the Machine. From that moment James went through the gears taking the next three sets with some fantastic darts. James is back in action this afternoon against Michael Smith. After an exciting week of Darts in Wolverhampton, the Grand Slam has come to an end. Again James has done us all proud by reaching the final; sadly it wasn’t to be, and James would finish runner-up to Michael van Gerwen. Over the week James played some fantastic darts, no more so than beating world champions Gary Anderson in the semifinals. James will next be appearing at the Player Champions finals at Minehead this weekend. James played in the Unibet European Championships at Hasselt at the weekend. James reached the semi-final before narrowly losing out to Michael van Gerwen. James was handed the toughest first round game, as he had to play world champion, Gary Anderson. James was in stunning form as he beat Anderson 6-0, this result gave James the springboard for the rest of the weekend. In the last sixteen James would play the German number one Max Hopp, the Machine never gave the youngster a chance as the world number 6 was too strong for the young German running out 10-3 winner. The final day of the European Championship James was first on against a very much inform James Wilson. Our James found himself 4-2 behind before a five leg blitz saw him race into a 7-4 lead, which included ton plus finishes of 106 and a breathtaking 161. James would go on to win the match 10-7. In the semi-final, James would lose out to MvG, but taking seven legs off the world number one was the most anyone managed all weekend. Following his run this weekend James is back up to world number 6 after he dropped down to world number 7. James will be back in action this weekend in Glasgow for the World Series Finals, where he will play either Benito van de Pass or Michael Smith. James is now the proud owner of a Guinness World Record, for the most inner and outer bullseyes in one minute. James set the record on the 23rd of September at the Motorpoint Arena, the Machine hit 15 in just 60 seconds. The top 8 of the PDC all attempt the record, but it was James who set the World Record. James reached the semi-final of the HappyBet European Darts Trophy at the weekend. James was forced to miss the precious Euro Tour event, as he recovered from a virus picked up in Australia. On Saturday James had to dig deep against Justin Pipe, and that’s what the Machine did. James won a deciding leg to take the match 6-5. On a busy final day, it was Andy Jenkins first for James, as the world number 6 saw off Jenkins 6-3. In the quarter-finals, it was Michael Smith up next for James, and this was a huge game as Michael is only just behind James in the world rankings. James was cool calm and collected like normal. All 11 legs went with the throw as James won 6-5, putting further space between him and Smith in the rankings. James had a mixed run at this weekend European Open in Dusseldorf. First up James would play Andy Boulton in the second round. In a tight match James would edge out Boulton 6-5, and head into Sunday’s final day to play Jelle Klaasen. In a scrappy game from both players, it was Jelle who won the game 6-3. James had his chances but just wasn’t the Machines day. 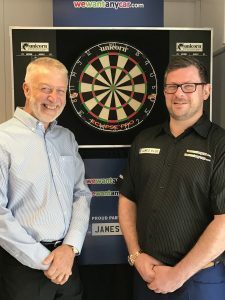 James will be at the weekend’s Pro Tour Barnsley, before heading to Australia for the next leg of the World Series. James will be playing in the Sydney and Perth Masters. After two great days of darts, James was runner-up in Shanghai Masters. On the final day, James won a thriller against double world champion Gary Anderson. The game went to a final leg showdown, and it was James who kicked off with back to back 180s to seal the match. In the semi-final, James would have to play the 16 times champion of the world Phil Taylor, and it was the machine who outscored Taylor to win 8-6. James would like to thank all the fans for their incredible support and to all his sponsors.